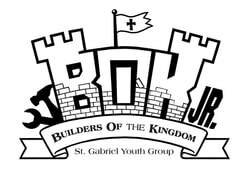 Junior High Youth Group "B.O.K.jr." ​ St. Gabriel Junior High Youth Group for grades 7-8. The goal of B.O.K.jr. is to help young people grow closer to Christ through social, spiritual and service events. The diocese requires that we have Virtus trained chaperones at all events. Parents, if you are willing to chaperone please let us know. Please remember too that permission slips must be signed when events are off-site. and of course, Cedar Point!